RALEIGH — The North Carolina House of Representatives altered a proposed abortion bill this week after Republican Governor Pat McCrory threatened to veto the legislation over his belief that it would restrict women’s access to an abortion. As previously reported, the North Carolina Senate recently passed a number of abortion-related amendments that it attached to the Family, Faith and Freedom Protection Act. The amendments, which had been characterized by some as “sweeping,” cover a number of aspects pertaining to the abortion industry. “Unless significant changes and clarifications are made addressing our concerns that were clearly communicated by DHHS Secretary Aldona Wos, Governor Pat McCrory will veto the existing bill, HB 695, if it is passed by the House and Senate,” read a statement released from McCrory’s office this week. Abortion activists also reminded McCrory of his campaign promise as both pro-life and pro-abortion supporters alike expressed disappointment in the governor’s actions — but for different reasons. Planned Parenthood and NARAL likewise released statements denouncing McCrory for considering the bill at all. After receiving word of the threatened veto, the House quickly made changes to the bill to scale back some of the wording, which McCrory and others believed was too “vague” and restrictive. On Thursday, the House Judiciary Committee approved the new legislation 10-5, which asks state health officials to construct facility standards that are not “unduly restricting access” to abortion. The full House later followed suit with a vote of 74-41. He now states that he will sign the bill if passed. 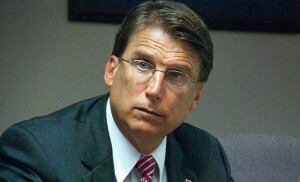 However, some residents have expressed disdain over McCrory’s attitude toward protecting abortion. “The governor is a huge disappointment!” wrote one commenter named Chip. The bill will now make its way back to the Senate for a final vote before being sent to the governor’s desk for signing. The ACLU has threatened a lawsuit if the legislation becomes law.